Vintage Life: We Love Penny Tiles! 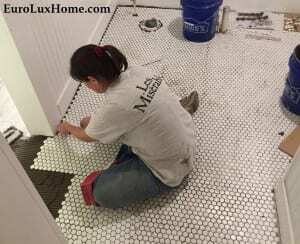 Greg and I knew from the start of our 1920s bungalow renovation that we wanted to place penny tiles in the bathrooms to keep the vintage look of our home. 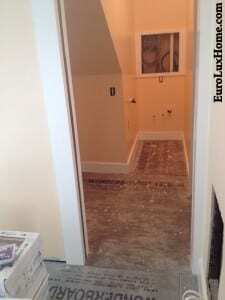 We started with the smallest room first: the half bath located off the living room/dining room. 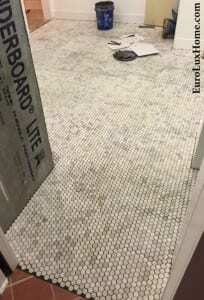 We chose all white tiles with a dark grey grout to emphasize the shape of the tiles. 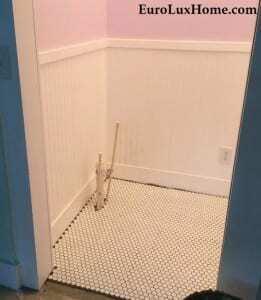 The beadboard trim was created with original beadboard from the ceilings and it is painted a bright white while the walls are a rosy lavender – I love it! I just can’t get a good photo because the room is so small, but I’ve added a beautiful Italian vintage Capodimonte chandelier complete with pink drop roses. 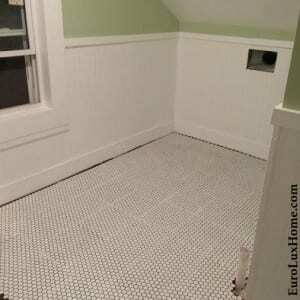 Next came the upstairs guest bathroom and small side closest, where we also chose all white penny tiles. I’m concentrating hard, here! 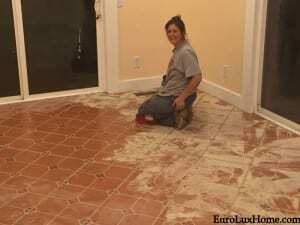 This was our first experience with penny tiles and we have to say that they are a little more difficult to lay than large tiles. Penny tiles come on square sheets, but the sheets stretch, which makes it a bit difficult to get the spacing exactly even. Our floors aren’t perfect, but I think they show vintage charm! 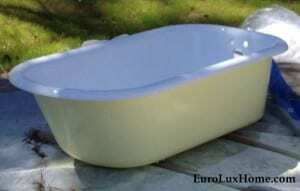 This is the finished upstairs bathroom. We carried the beadboard trim motif upstairs too but we had to use new beadboard sheets as we had run out of the original old beadboard. The trim is painted a bright white while the walls are a pretty green tea. 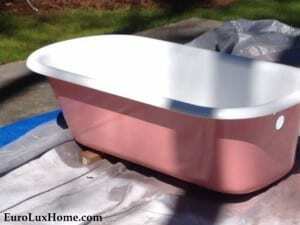 It isn’t installed yet, but this is where my restored pink claw foot tub will go! What do you think? For the master bath, we chose marble penny tiles featuring varying shades of grey and white with hints of blue and yellow. We set it off with a dark grey grout. We used the last of the original beadboard, painted bright white, in the alcove where my restored yellow claw foot tub will go. We also added a bling-y vintage Rococo chandelier with sparkling crystals. Ta-da! 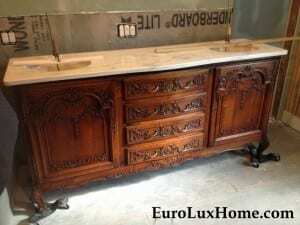 Although it is not installed yet as we haven’t finished tiling the large walk-in shower and the adjoining wall, we have converted an antique Louis XV sideboard into a double vanity by removing the top and replacing it with Alabama white marble with grey veining to complement the tile floor. 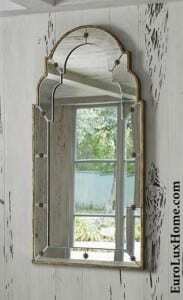 We’re considering placing a pair of the new Ambella Home Star Mirrors over the vanity. Here’s a photo of the mirror – let me know your thoughts in the comments below! If you just can’t get enough tales from the tile side, our last Vintage Life: Time To Tile! 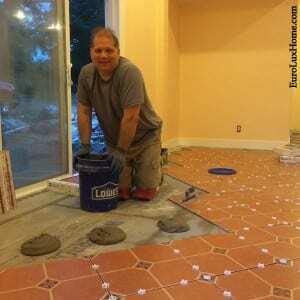 blog post talked about our adventures with the pretty Mexican tile in the kitchen, sun room and utility room. Grout on! 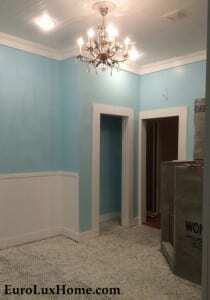 This entry was posted in Vintage Life: Our 1920s Bungalow and tagged 1920 Bungalow Renovation, 1920s bungalow remodel, Ambella Home, Bathroom, Louis XV, Newberry South Carolina, old house restoration, Replacing Old Floors, tile, Vintage Life on April 22, 2015 by admin. 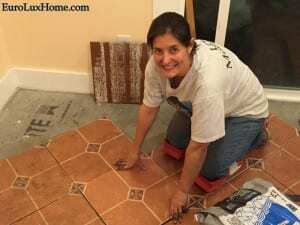 Vintage Life: Time to Tile! In the continuing story of our 1920s vintage bungalow renovation project, now that the walls were up and painted, we needed floors! Greg and I have completed several tiling projects together so we knew we could tackle this project too. 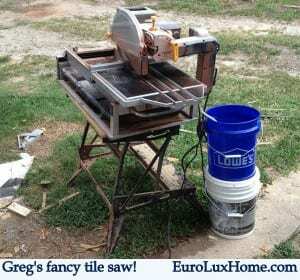 Besides, Greg really likes to use his fancy tile saw. 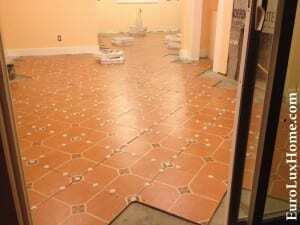 We started with the largest area first – the kitchen, sun room and utility room – which would all have a pretty Mexican tile that complements the warm Creamsicle color on the walls. 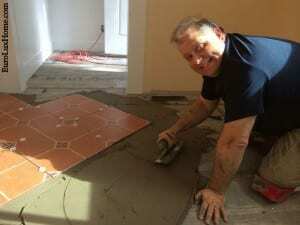 while Greg cuts the tiles. Greg then puts down the mastic in sections…. Yep, we’ve got to be extra careful to keep all our cats and dogs out of the room at this point! Finally, I lay the re-lay tiles on the mastic, press down firmly and get them aligned with spacers. It isn’t difficult work but it does take time to get it right. We spend so much of our time in front of the computer on a daily basis that it is actually fun to work on a project with your hands that requires your total concentration. 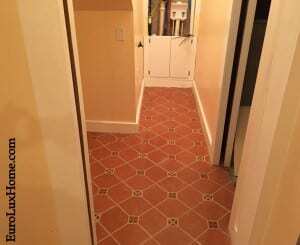 It took three full days to put down all the tiles in the kitchen, sunroom, and utility room, which we did over a long holiday weekend. The next step is to fill all the spaces between the tiles with grout, which makes a great big mess. I actually think cleaning up the grout at the end is the worst part of tiling! But it’s all worth it in the end. 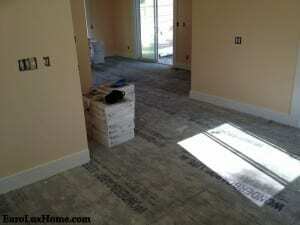 Above is the finished sunroom floor. One has a brass finish and the other is a Flemish chandelier with a copper finish – to give an interesting mixed metals effect. I recently wrote a blog post about the trend for mixed metals in home decor so it seem we are all the rage! 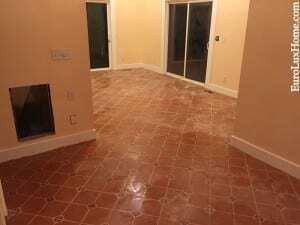 This entry was posted in Vintage Life: Our 1920s Bungalow and tagged 1920 Bungalow Renovation, 1920s bungalow remodel, kitchen, Newberry South Carolina, old house restoration, Replacing Old Floors, tile, Vintage Life on March 30, 2015 by admin.